Amitava Das was born in 1947 in New Delhi. In 1972 he graduated from Delhi College of Art, New Delhi. In 1978 he had a solo exhibition at Dhoomimal Art Gallery, New Delhi. In 1989 he exhibited in a solo show in New Delhi. In 1990 he had a solo show at Sakshi Gallery, Chennai. In 1995 he exhibited ‘Works on Paper from 1972-1994’ at Sakshi Gallery, New Delhi. In 2004 and 2007 he had solo shows in Mumbai and New Delhi. In 2007 he had a solo show ‘You Shall Remain Hidden’ at Gallery Espace, New Delhi. In 2010 he exhibited solo at Sakshi Gallery, Mumbai. From 1974-1975 he took part in groups show at Ravindra Bhavan, Lalit Kala Akademi in New Delhi and at Jehangir Art Gallery, Mumbai. From 1977 - 2007 he took part in several group shows at New Delhi, Germany, West Bengal, New South Wales, Poland, New Delhi, Mumbai, Kolkata and Chennai. In 1977 he participated in 'Pictorial Space' at Ravindra Bhavan, Lalit Kala Akademi in New Delhi. In 1994 he participated in a group show at the All India Fine Arts and Crafts Society (AIFACS), New Delhi. In 1995 he participated in View from the Edge at Jehangir Art Gallery, Mumbai. In 2005 he took part in Concept & Ideas at Centre of International Modern Art, Kolkata. In 2006 he took part in The Naked Line: Drawings by 12 Artists at Delhi Art Gallery, New Delhi. In 2008 he participated in Frame Figure Field - 20th Century Modern and Contemporary Indian Art at Delhi Art Gallery, New Delhi and took part in a group show at Centre International Modern Art, Kolkata. In 2011 he participated in Melange at The Harrington Street Arts Centre in Kolkata. In 1976 he won the National Award from Lalit Kala Akademi, New Delhi. In 1982 he received the Sahitya Kala Parishad award in New Delhi. 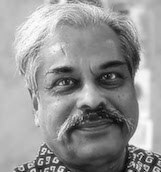 In 1980, 1981 and 1982 he won awards at the All India Exhibition of Prints in Chandigarh. In 1989 he received a Fellowship from the Federal Republic of Germany for the Advanced Exposure to Exhibition and Graphic Design. Amitava lives in New Delhi.